Turkish Airlines has been our go-to carrier when travelling to the Maldives from the UK in the warm months (when British Airways does not offer its direct service). I already posted a pretty comprehensive overview of the flight experience, but I didn’t mention much about the Istanbul hub (just that it had a few food outlets and relaxation areas). The Istanbul airport has come on massively in just the three years since. From the UK from April through October, there is no direct service to the Maldives. So visitors have to choose from an array of stop-over options among the hub titans. Unless you want a bit of a detour for one of the Far East hubs (eg. Singapore, Cathay Pacific, or even Sri Lankan), the most prominent choices are the three battling for dominance as the crossroads between Europe and Asia – Turkish (Istanbul), Emirates (Dubai) and Qatar (Doha). Turkey has held the title for much of history as Istanbul (formerly known as Constantinople has been the nexus where East meets West). And they are not going to yield that strategic position easily no matter who much oil money the upstarts on the Arabian peninsula have to throw at the battle. Istanbul airport has long been a bit of a “Third World” facility with more brute force (sheer numbers of flights) behind it than elegance (compared to the flashy new constructions at Dubai and Doha). But Istanbul is slowly but steadily making improvements to turn itself into a world class airport. A profusion of cosmopolitan shops and trendy eateries have cropped up with Sbarro and Burger King edging aside the tired beef stew in the generic airport café, and Hugo Boss encroaching on the Turkish Delight stands. They have fixed most of the bottlenecks with security in the International Transfer section which used to mean long queues as x-ray machine in the middle of the night and the middle of your long journey. The one aspect are that remains decidedly Third World are the restrooms. Packed with queues and horrid smells. Your best option is the ones at the lower level underneath the food court (somewhat cleaner and very few people). That area is where you will also find some quite attractive “rest” options. The first is quite literally a “Rest Area”. It is two rooms (one for men and one for women) with dimmed lighting and thick, padded mats on the floor (like you used to nap on in kindergarten). For those who couldn’t sleep bolt upright in the long-haul first leg and have a long lay-over, it is an oasis of comfort and repose. Free of charge too. 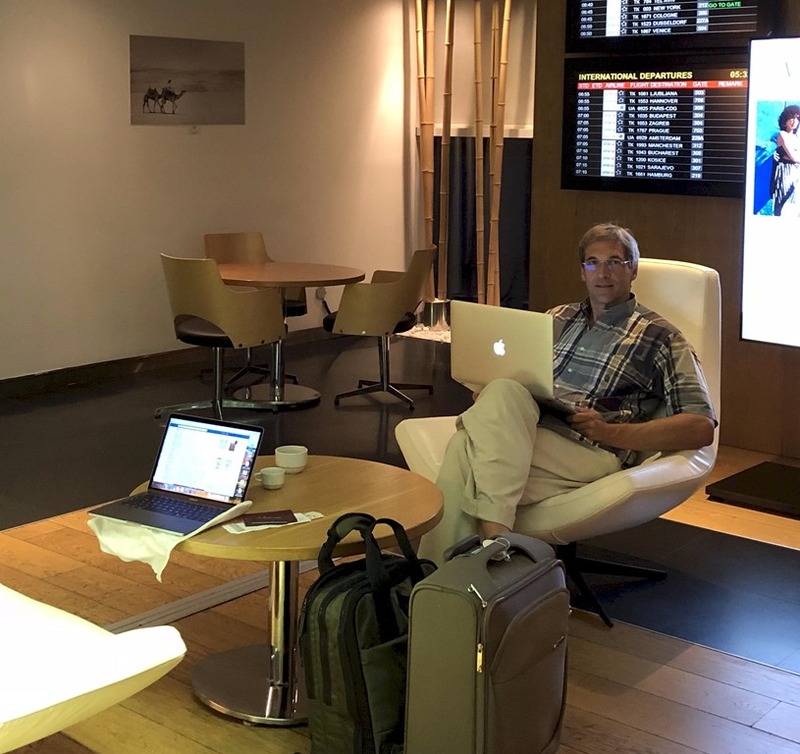 The whole area by the Food Court end of the terminal is also filled with a selection of 5 lounges to provide a range of transfer creature comforts. The first option is to check whether any of your frequent flyer status or bank/credit cards provide you with free access (one of the lounges is the HSBC lounge with free access for its premium card holders). Note that if you plan to re-charge your electronics devices at Istanbul, the power outlets at European (if you go to Premier Lounge, they have an adaptor they will loan you). Another annual pilgrimage to the sacred destination of our dreams concludes. The sunrises, snorkel spottings, villa photoshoots, property tours, transfers, treatments, pina coladas, sunsets and star-gazing has finished. Now begins the remote re-living of our time cataloguing the photos, editing the videos, transcribing the notes, emailing the follow up questions, updating the database and reliving the our time there from afar. 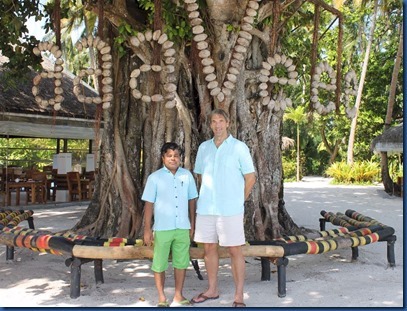 This whirlwind exploration of Dhaalu anew, Lhaviyani renewed and assorted undiscovered corners of Kaafu brings our lifetime total of resorts seen to 91. According to everyone we have spoken to, this puts on the top of the table as world leading visitors (Though Michaela Reisser is chasing us down. If she catches us, I might have to refine our bragging rights to being the “amateurs”, or true aficionado, with the most visits as she is a travel professional). 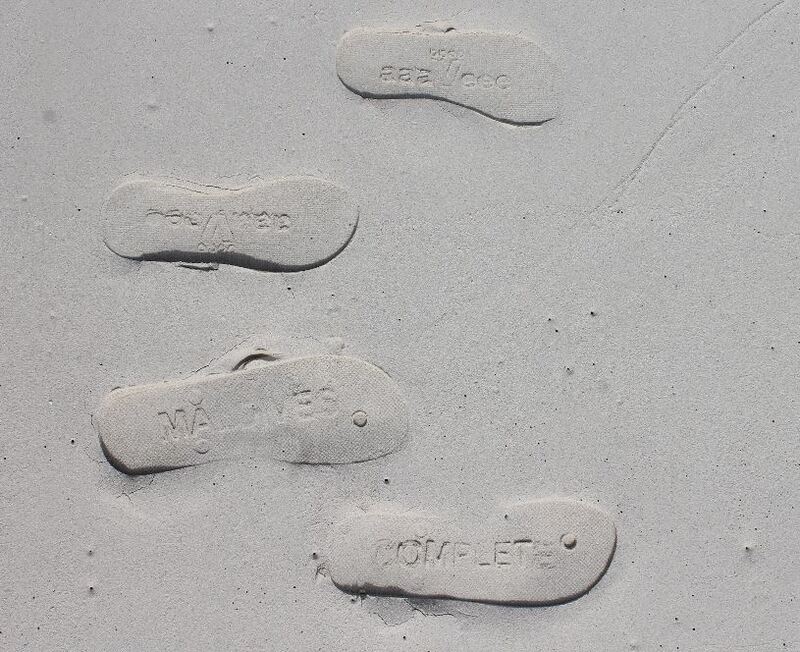 No Shoes – From the very outset. This trip was our first literally “no shoes” visit to the Maldives. We typically change into our flip flops at the first resort and don’t pack them again until we are heading back to the airport. But this year, we actually wore our flip-flops to the airport. 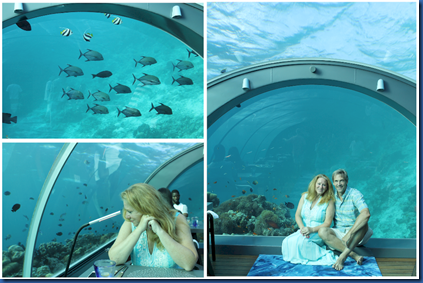 Underwater Dinner – We have had an underwater massage, underwater night show, underwater cocktails, but we have never sat down for a dinner. Swim in a pool, even a private pool dip – The key reason why we didn’t avail ourselves of our private pools when we had them (and increasingly common amenity) is that the previous week had a lot of rain so the pools were quite chilly. Usually, they are baking in the sun and are a relaxing tepid temperature, but I think the ocean (sadly) was warmer than the pools most of the time. See as many things snorkelling – The coral damage of the rising ocean temperatures exacerbated by the recent El Nino as well as the COTS infestation has been well reported, but this trip was the first time we seemed to see less marine life on the coral-denuded reefs. Of course, that is the obvious knock-on effect to coral devastation. We didn’t see but a single reef shark snorkelling (the puppy sized ones still frequent the shallows) and the fish soup just seemed a bit thinner. See a great sunset – One of knock-on effects to the July travel, with its variable partly cloudy skies and passing rainstorms is that there is really too many low lying clouds to allow for a great sunset. Their low altitude means they reflect less of the sun when it dips below the horizon. Also, the excessively thick collection of clouds stand between you vantage point blocking the sun itself as it sets in the distance. Intimacy with the ocean – The ocean dominates everything. 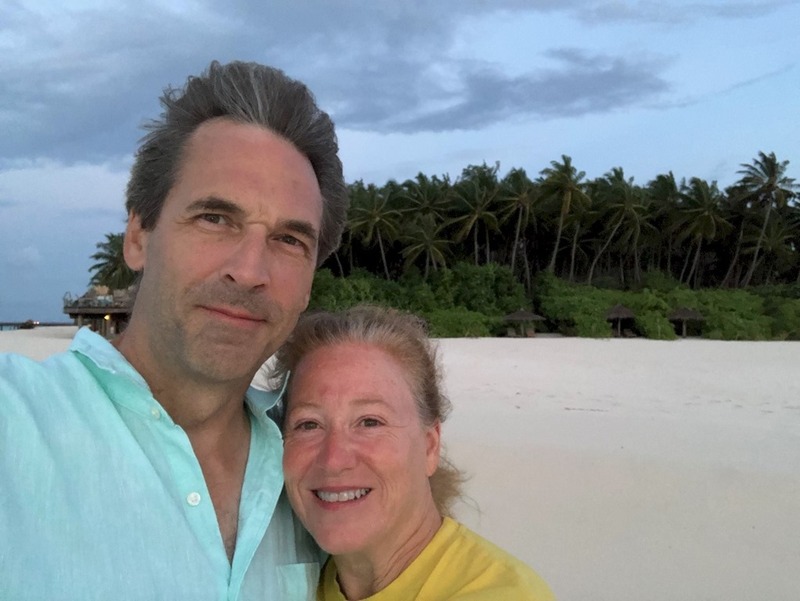 In contrast, when we were at a similarly tiny island in Indonesia, you still felt the distinctly “on land” and surrounded by as much land as ocean. Some Maldives purists don’t like water villas claiming they are not native (an invasive architectural species from Bali) not to mention that constructing them can be environmentally disruptive. But I feel that they are in keeping with the essence of this ocean intimacy. Value is Back – So many people have bemoaned the gentrification of the Maldives resort neighbourhood. It seemed that everyone favourite 3-4 star resort was being relaunched as a glitz super-deluxe property at several times the price. The whole guesthouse movement has replenished the stock of rooms at the budget-priced bottom end. But also, a slew of new openings have targeted the value-priced middle market in recent years. Increased ease of operation with Maldives tourism infrastructure, local skill sets and know-how, supply chain has made is easier and cheaper for resorts to build and operate which will help temper holiday inflation. Salt Shakers – Why does any resort feature these? They never work. Even when a few grains of rice have been mixed in the salt. I guess there is a potential hygiene issue with using salt cellars instead if everyone put their fingers into the well, but they could use little spoons (which is the mannerly way to use a salt well). Mother and Child Reunions – One final observation is that during our tour we encountered several single women travelling with a young son. Is this some sort of highly specialised niche that the Maldives could cater to? Participant, Not Spectator – One of the reasons why I do Maldives Complete, is because I am more of an “active participant” than than “passing spectator” in this amazing part of the world. I’m that way with other parts of my life like sports where I play many sports to a high standard, but don’t really watch that much. This trip reinforced that dimension as the first half of the tour seemed like a reunion of old friends – Bunyamin, Aima, Nazeeh, Mahudhee. While it all seems to many like a glorious holiday, each of these trips is quite a bit of work. It is actually more work these days to get material because the Maldives Complete website is more complete very year. Resorts do a better job of publishing more information to the web, and what they don’t publish, their guests share amply on social media. Still, the visits are invaluable to identify the smallest and least conspicuous of details as well as to continue to build relationships with the people behind this paradise. 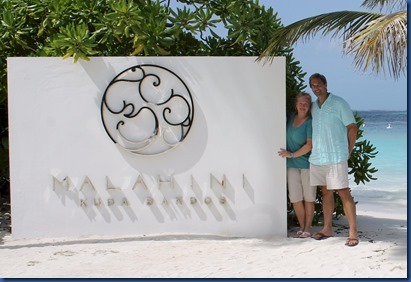 Take picture in front of resort sign (for the resort overview post). Visit the dive center to find missing dive sites and dive charts. Sunset pina colada (this one isn’t that much work). Write and send a follow up email to resort to request additional material and details. Load the material and photos onto the site (with necessary formatting). Load house reef sightings into Snorkel Spotter. Write and post Tour Report. After this tour, our path across the Maldives is shown below in a map of where we have stayed (all the green stars are places visited and all the yellow ones are all the others which are on our bucket list). 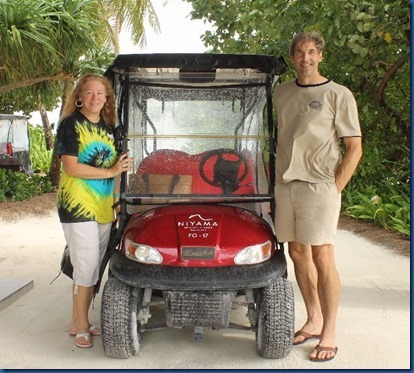 Next year we visit Raa atoll which is the last atoll we have not yet visited which has more than two resorts on it. We can’t wait! Malahini Kuda Bandos is one of the best bargains in the Maldives. With some promotions, you can find rooms just over $100. And that’s for a proper resort. Not a guesthouse. Not a hotel. 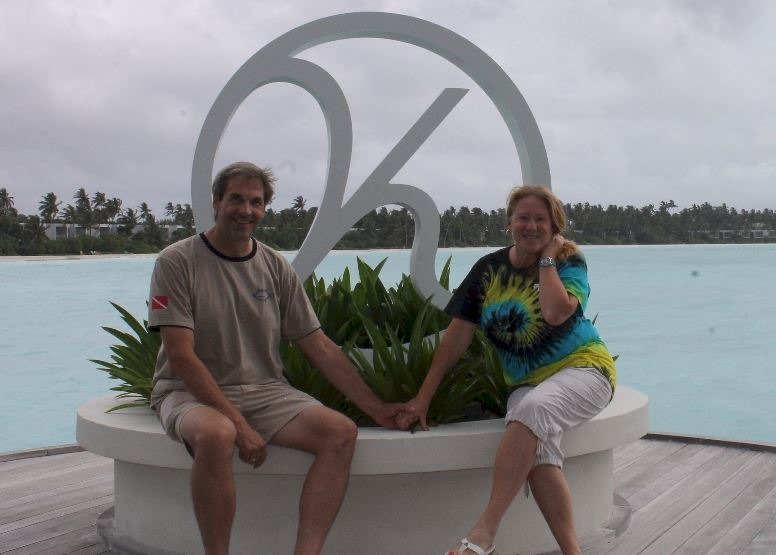 The rooms are no Ritz Carlton and the restaurant is not Alain Ducasse, but it is the Maldives. And it includes a number of first class features. 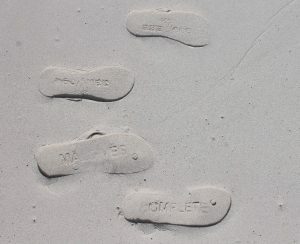 The island is a gem with some of the softest sand on its beaches as you will find anywhere. Pancakes are lighter and fluffier than anywhere in UK and the buffet also includes Red Velvet Croissants (who knew those were even a thing). With an extensive buffet you can find something you like a lot. You are getting the same omelette, porridge, fresh fruit that you get a 5-star property. It has a very accessible housereef with a nice drop off (though it has also suffered the bleaching that has affected all Maldives reefs). The island is a convenient 15 minute transfer from Male, but you are far enough away from the capital that you don’t feel like the urban island is breathing down your neck, but instead is off in the distance on the horizon. The rooms are simple, but they are new, fresh and attractive styling. The majority of rooms are Garden Villas which are not everyone’s idea of a tropical holiday (being in a block of apartments in the centre of the island), but they have their dividends. The underwhelming room forced us out of the room to go to the Bluu bar and enjoy a wonderful evening and morning by the beach. The obvious key attraction is their price. The bedrooms even an extra sleeper lounger for a child to stretch your room cost even further. One final, observation that I’m not sure how to interpret: a very large proportion of the guests were two females. Wondering if I was just getting a skewed sample that was adding to a confirmation bias, I did a count of tables at breakfast, and yes, half the tables were occupied by two women. Curiously, Lori has been plotting over WhatAp during our trip for the dream of all her girl friends coming to the Maldives for a girlie trip. With a group of friends, the digs don’t have to be fancy, and you do need to sort of cater to the lower common budget so everyone can manage the trip. So maybe there is something in Malahini Kuda Bandos being a girlie escape destination. Good design adds value making the whole greater than the sum of its parts. 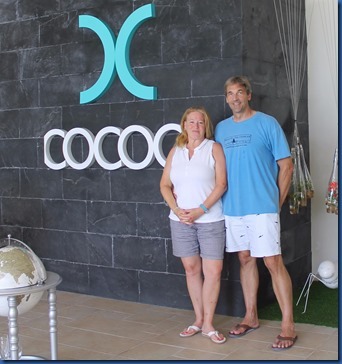 Cocoon describes itself as “the first design resort in the Maldives”. I wasn’t sure about the “first” as I have seen lots of fine design across the islands, but it certainly first class for this spirit of design – adding value. And in so doing, it is one of the best value 5-stars you will find. I find many of the bling palace resorts doing the reverse – trying to inject cachet into their properties by importing the most exotic materials and ingredients, anything shiny or rare, and throwing them together on a grand scale with an equally towering price tag. They are a pile of the trappings of luxury and not luxury by design. The property is named after the movie “Cocoon” and the magic pool that brought eternal youth (One of the more inspired resort names. The group is also developing a sequel, “You & Me” in the Raa atoll which happens to be a film about even more intensive recovery). But the inspiration for the property design is Italian designer Lago. A range of clever, distinctive and actually subtle touches filled my “Best of the Maldives” notebook during my visit (stay tuned). Equally to the clever and subtle styling, it was the value that impressed me. Priced more like many 4-stars, the resort has designed its entire proposition to optimise not just the guest experience, but the bank account experience. Each beach villa has a comfy sofa bed for an extra child and they can bring in a second roll away. For a limited time, they are offerings a two kids eat and stay free (guests do have to pay for the transfers). That would have been a top appeal when we were visiting as a family. And their a la carte Manta restaurant is extremely reasonable with main dishes around $20 (not too much different to a decent English gastro pub). 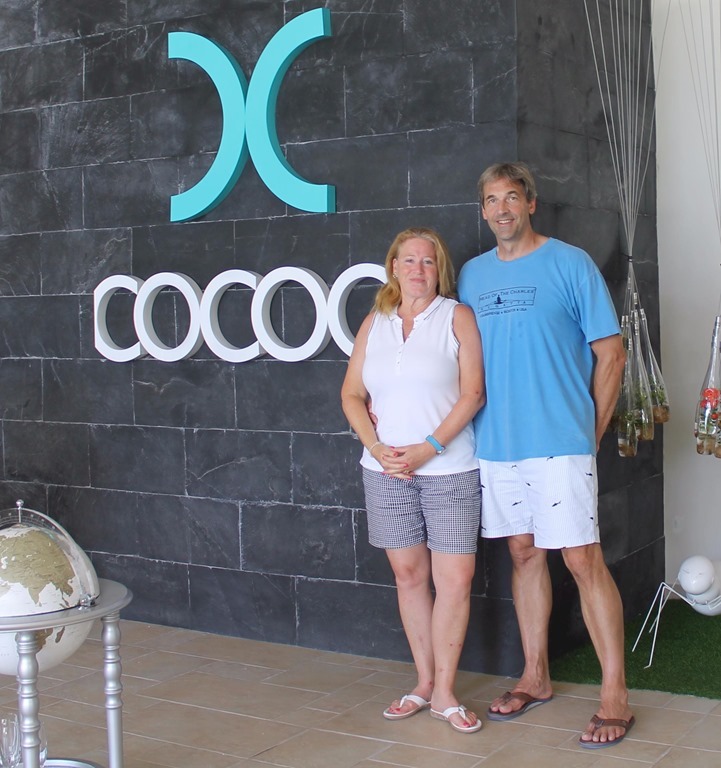 If you are put off by the escalating prices of the Maldives or wary that too many value-priced “5-stars” are just tired properties compensating for their dated look and wear-and-tear with discounting, then you need to get a quote from Cocoon. Hurawalhi is a “5+” star resort. I could almost make the case that it is a “6 star” resort, but the marketing director for the resort says “Wait till you see Kudadhoo” (Champa’s latest offering under development just across the water along their chain of properties at the top of Lhaviyani atoll). One of our frustrations in past was that everyone in the Maldives was calling themselves a 5-star (over 60% of the resorts in the Maldives Complete database are listed as 5 star). And you will find some real divergences in the quality of what is being called 5-star. On one end are properties that are quite indistinctive but get away with over-rating with a “5-star” label because, essentially, the destination is 5-star. People come and no matter how tired the décor and limited the offerings, the place still seems like a 5-star experience because the guests are blown away by the stunning surroundings of the landscape and seascape. I have often said that you could have a 5-star experience in the Maldives staying in a cardboard box on the beach. On the other extreme are properties that really don’t seem right to call ‘just’ 5-stars. The ultra-deluxe properties that seem to defy any sort of rating scale. I tend to call these “super premiums”. They are really in a class by themselves and hence some people in the industry refer to them colloquially a “6 star” properties (the Burj Al Arab took a bit of stick when it opened, referring to itself as the world’s first “7-star hotel”). The whole star rating system is a bit of a mess. It started as a hospitality industry standard tick-box exercise for certain amenities on the resort (eg. the number of power outlets and whether you had a bidet or not). People confused the hotel “rating” with the review ratings of guides like Michelin and Zagats. Then, crowd-sourced ratings came to the web on popular travel sites like TripAdvisor and Booking.com. These ratings tend to reflect another aspects altogether. They are really about ‘performance against expectations’. As a result, you can get real dives getting ‘5 star’ reviews because the experience is so much better than the guest expected for the pennies that they paid. Furthermore, all the reviewing is basically being done by amateurs. Given the power of ratings from sites like TripAdvisor, many properties now seem to be going in the direction of under-rating. They call properties that could easily pass as 5, a 4-star. But they often append the now popular “+” designation to note a cut above the rest of class with a bit of style and distinction, but (sensibly) fear exaggerated expectations if they don the 5-star moniker. It is a way of saying “4 star with 5 star touches”. All of this diatribe about rating is to provide context for my description of Hurawalhi. Hurawalhi is the first resort I have found where this approach would be appropriate at the 5-star level, ie. 5+ star resort. Hurawalhi is very much a 5-star star through and through. Every design feature, attention to detail, material choice, offering, etc. are all specified at the first class level. Natural wood everywhere (and the wood shingled roof, instead of thatch, which will save lots of total cost of ownership). Think Rocky Mountain Lodge or Chamonix Chalet, not native hut. Every single fixture and external appliance is tastefully and craftily covered. Their flawless attention to detail with this simple, natural material shows that you don’t need Italian marble and exotic materials to produce a stunning environment. Just elegant design with quality materials. The biggest above-and-beyond the world of typical 5-star is the resort’s underwater restaurant, 5.8. I’ve posted about the 5.8 previously in its construction stage where its sheer ambition presented so much promise…and expectations. But now I can put a bit of first-hand perspective into the account. The food doesn’t get much better than this. “Smoked lobster and sea urchin mousse served on a garland crest with cognac emulsion, lobster salsa, squid ink brittle, poached langoustine tail and topped with beluga caviar served 5.8 metres underwater.” Yes, that. We’ve eaten at several 3-star Michelin’s in our foodie adventures and 5.8 stands shoulder to shoulder with them. But the real experience is the room itself. I have visited several of the Maldives underwater facilities, but I had never actually taken the plunge (so to speak) of dining in one. More than any other one I have visited, Hurawali has done an exceptional job of placing the restaurant and enhancing its location. One side is right on the edge of the house reef drop off and the other opens to the expanse of the lagoon. Between the two, through the floor to ceiling glass wall is a sort of canyon that provides a view of coral and fish in sort of a raked fashion. Like many other underwater rooms, they have done a bit of reefscaping to provide greater visual appeal and to attract more fish. But a clever little twist is a sunken mini-dhoni ‘wreck’ in the lagoon which not only provides an added lure for reef fish (and a sequestered moray we spotted), but also adds a bit of eerie mystique to the whole vista. While they do both a private breakfast and a lunch seating, the best time to go is for dinner. You are greeted with a sunset cocktail while the sky is still bright and underwater is still vibrant with sunshine piercing into the water. But as the 7-course affair progresses, the light subtly changes with every course and so does the marine life and activity. Until by dessert, it is completely dark and the nocturnal activity is in full swing. And it’s not just the sea creatures that are a buzz. The whole place has a unique camaraderie of a unique shared experience. Diners commenting to each other on curious spottings, asking questions, sharing reflections, helping with photo taking. Objectively, 5.8 is the greatest (in size) underwater restaurant in the world. 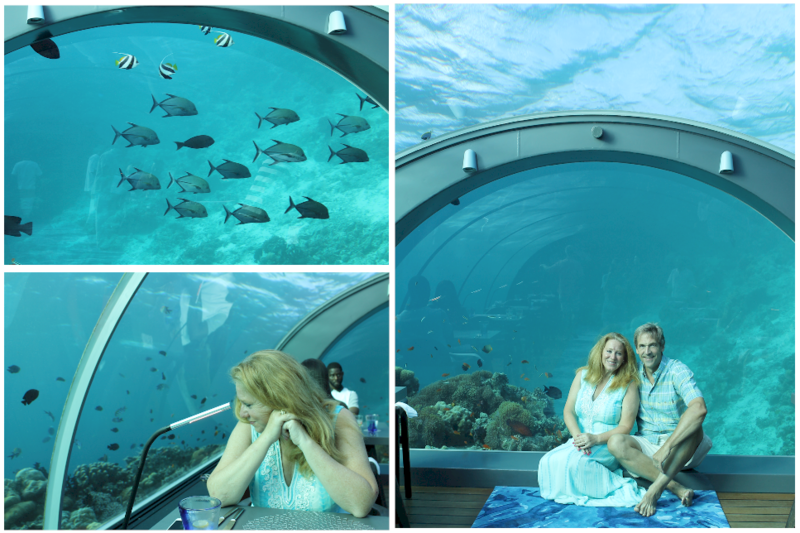 But subjectively, 5.8 might just be simply the greatest underwater restaurant, full stop. 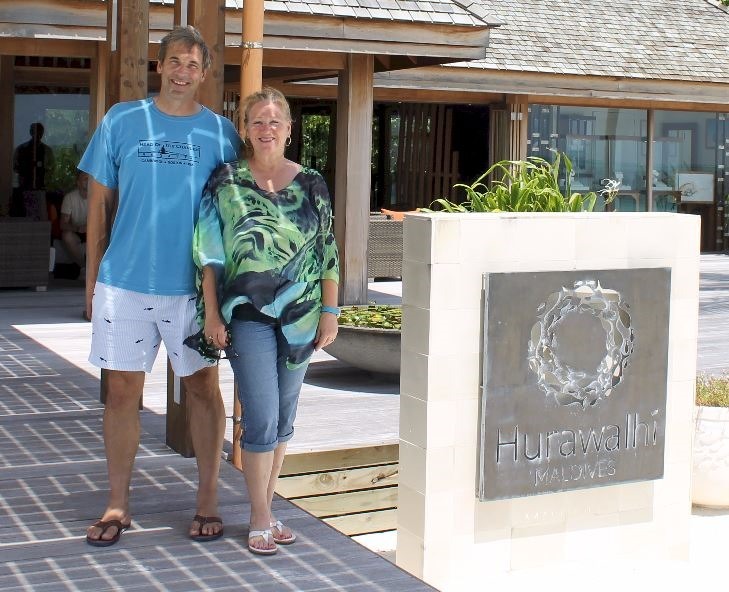 And Hurawalhi might not let you call it a 6-star, but it is so much more than just 5 stars. Breezy and easy. Grand Park Kodhipparu simply struck us as an easy resort. Easy transfer, easy access to everything on the diminutive island. Easy access to one of the several house reefs from the water villa (just a few dozen feet from the back deck). The resort was a particularly welcome respite after the frenzy of several days of island hopping. I‘m sure it would be one for someone wanting more of an escape holiday. It’s also a bit easy on the wallet as it is value priced in the 5-star segment while offering a thoroughly 5-star experience in build, service and amenities. 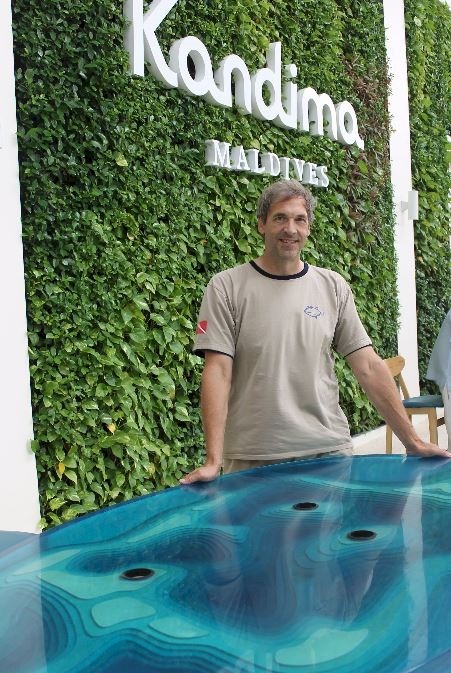 I came away with a number of candidates for future Best Of the Maldives pieces and the GM Raffaele shared some intriguing plans for further enhancements they are working on. We also extended our string of serendipitous meetings. This time with a longstanding connection on the web-side: Ibrahim Mahudhee, Managing Director at Maldives Promotion House which does the website Maldives Insider. MI is often the first to scoop breaking news on the resorts and is the source of many additions of planned resorts to the Maldives Complete database as well as leads for Best of Maldives innovations. I’ve been considering doing a piece for MI for a while and Mahudhee encouraged me to do so as we exchanged a few ideas on topics. If you are stressed by all the choices in the crowded luxury sector of Maldives resorts, Grand Park Kodhipparu is an easy choice. 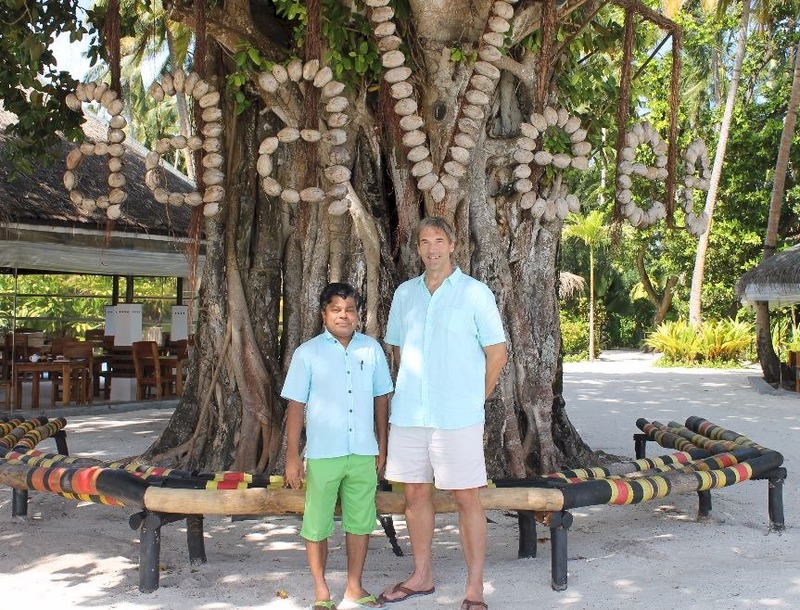 For someone who has been coming to the Maldives for 20 years, arriving at AaaVeee was like seeing an old friend. In more ways than one. Not just its classic, retro-Maldive simplicity and rustic style, but also on a personal dimension as well. This tour is turning out to be a Reunion tour of Maldives friends – Bunyamin, Aima…now Ahmed Nazeeh who is managing sales and marketing at the property. Nazeeh and I first met in 2012 when he was looking after Holiday Island (see photo at bottom). So arriving at AaaVee treated me to another greeting by a Maldivian friend. “AaaVeee” means “revival” which refers to their revival of the resort style that first started the Maldives tourism industry back in 1972. Like Holiday Island (well, the way it was in 2012, they have changed the villa exposures now), you can’t see any villas from the exterior. Just uninterrupted, unspoiled luscious lushness. Indigenous rusticity pervades the property reminding me of an Italian agri-tourismo vibe. Not only is the food sourced locally, but the furniture and villas themselves are as well made by local artisans at workshops on the island. There must be more palms trees per square foot than any island I have ever been to. And AaaVee goes to considerable lengths to keep and nurture even more. Many of the buildings were simply built around the trees with their trunks sticking through holes in the roof. 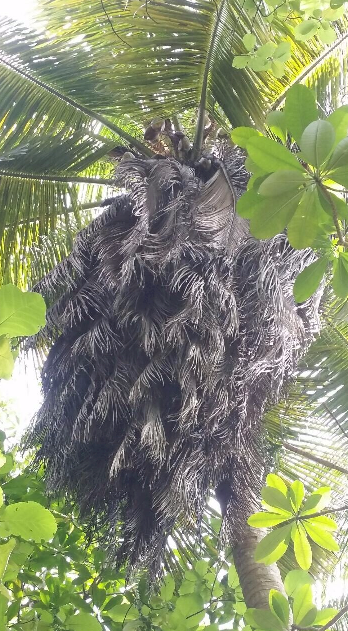 In fact, the palm trees themselves do their bit as well. Nazeeh showed me a few seedling “twins” on the island (two trees growing out of a single pod). 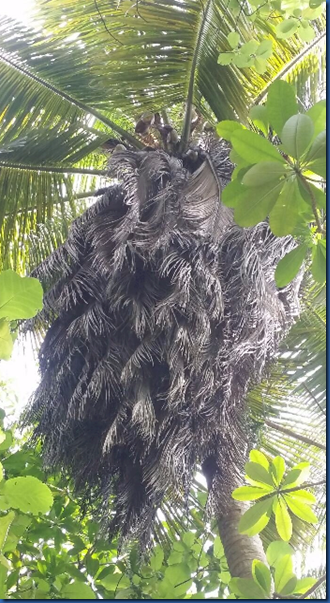 And the island features a very curious specimen which refuses to shed its fronds when they die (see photo at bottom) creating quite a striking collection of old fronds. The seaplane to the resort is a pricey addition to your holiday cost, but if you are looking for a long stay, it is an economical option with attractive value pricing. Another bonus is that you can actually go on a whale shark excursion to the famous South Ari Atoll Marine Protected Area. If you are looking for a value priced eco-resort, you won’t get much more native nature for the dollar than AaaVeee. I am a sucker for aesthetic design. 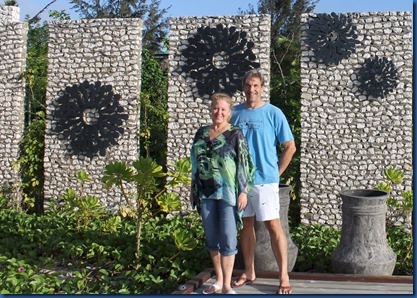 So many resorts try to capture the Maldivian spirit by emulating the traditional design and craft. Kandima’s inspiration comes from nature. Predominantly the ocean (with a rich, pervasive palette of blues), punctuated by vibrant greens and touches of palm fronds. Kandima has perhaps my favourite reception area. Like the entire resort that it welcomes you to, it is modern, dramatic, creative. It’s cathedral-like nave opens to the blue skies. It is no surprise then that I bumped into my favourite Maldivian artist, who is actually an artist-in-residence here – Aima Musko. I was Aima’s first as an artist, and then a customer of hers for design as she re-conceived the Maldives Complete logo and website theme. 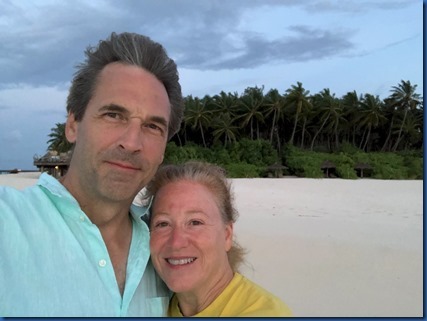 We have stayed in touch as friends over the years and it was a real treat to meet up with her face to face again at the resort. I knew she had been here when I wrote about the Kandima Artist’s Studio, but I thought that was a short-term event or promotion. It turns out that the Studio is a full time programme that the resort continues to invest in and expand (stay tuned for a profile on this young lady who is a talent show in her own right). Kandima is ranked as a “4+ star”, but really it stands shoulder to shoulder with about any standard 5-star resort and is in fact far superior to many Maldives properties claiming to be 5-star. The restaurants are as good as any top-flight property and actually, some operators are calling Kandima 5-star whether the resort does or not. 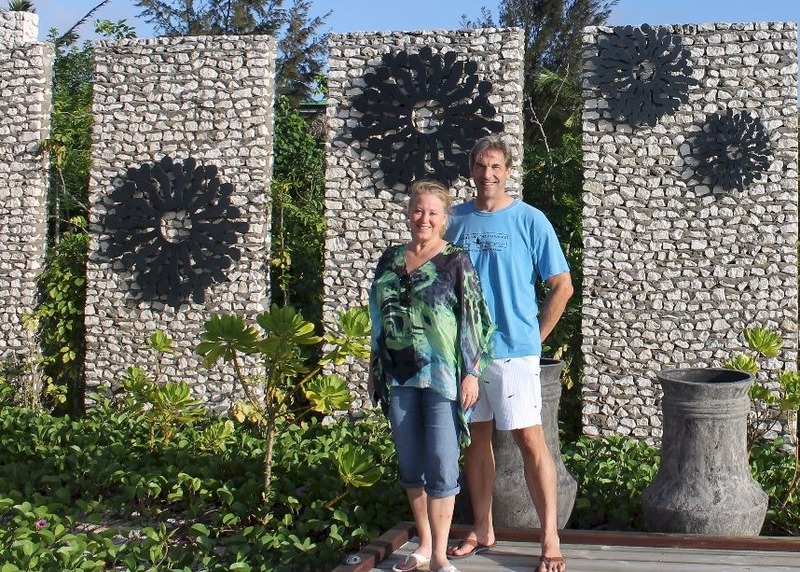 If you appreciate design artistry, then Kandima is one of the best value for money options in the Maldives. NIYAMA has the potential to be one of the top “foodie” resorts in the Maldives. I can’t say definitively because I didn’t have the opportunity to sample too much of their cuisine, but half of the Best of the Maldives pieces I have done to date about NIYAMA have been about their dining, and more than half of the new pieces I discovered during my visit were F&B related (and I didn’t even venture into any of the gourmet a la carte outlets). A bit of a foodie mecca with the longest standing molecular cuisine and concept eateries like Tribal and Nest (mind you, you do pay for the indulgence as simple starters can run $40). I was thinking that NIYAMA would be in the “super-premium” (aka “6 star”) category, but it is really more like a “5+” star (the “+” being for the food). Its famous Sub Six underwater restaurant is a “wow” item you tend to find in the super premiums. It is priced competitively in the $1000-$2000 range for 1 bedroom beach villas (the super premiums tend to start at around $2000). More for multi-millionaires (or ‘ordinary’ millionaires splurging) than billionaires, more Neiman Marcus than Bergdorf Goodman, more Conran than Ive, more BMW than Aston Martin. It also reminded me of a big event in my hometown “Pub in the Park” where Michelin star food is served up along second bill rock acts like 10cc and Mel C. Or, another comparison close to home, Marks & Spencers which features the most posh food hall on the high street along side a rather conventional clothing range. First complementary bottle of champagne…actually drunk. We get presented with complimentary bottles all the time but never drink them. But the weather sequestered us in the room so pop went the cork. First Bath – First time the temperature was cool enough that a hot bath sounded like a good idea. Though we did hit the ultimate first world problem – we forgot to bring our glasses of champagne to the tub. First in-room movie – Appropriately enough, we watched “The Shape of Water” on the in room television as inclement weather was limiting our midnight walks and sitting under the stars with our post-prandial pina coladas. If you are a connoisseur of gourmet delicacies, then NIYAMA could be absolute paradise for you with lots of firsts for your discerning palette. Maldives Classic. A great way to start off was to visit a resort that evoked so much of the classic Maldivian character that we have fallen in love with over the past two decades. A number of resorts claim to have indigenous inspiration and plenty have touches drawn from the local aesthetic, but few have been so completely infused with the style and materials of a traditional Maldivian village as Makunudu. I remember describing the Komandoo villa, with its homey feel, as a friend’s beach house we had been invited to visit. 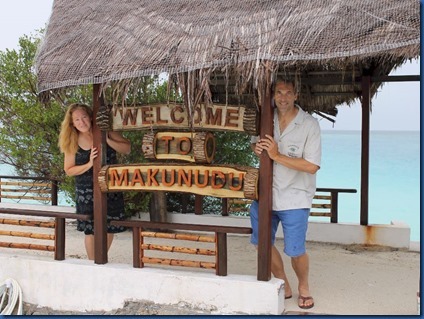 Makunudu had a similar feel, except that the owners of the beach houses are Maldivian. It feels like these villas might have been houses built generations ago with traditional techniques (eg. weaving, tying) and materials (eg. thatch, bamboo), but have been updated over the years with the contemporary amenities. Like a French auberge, English cottage, or Swiss Chalet with fitted with modern conveniences. The resort actually has undertaken some relatively recent refurbishments which are extremely astute. First, smartening up the bathrooms. Some refreshed stone and slate with updated fixtures (eg. rain showers) give this important room a fresh feel. But perhaps the best investment was their purchase of not only highest quality beds, but also mattress toppers (literally) on top of them all (literally) wrapped up with high thread count bed linen. The bed was simply one of the most comfortable I have slept in. What they did not fritter away money on are amenities that not only do many Maldives fans find unnecessary, they actually find them to be a detraction – TV, gym, buggies. I didn’t know that much about Makunudu before my visit. I think that is because it was a bit older and until the arrival of new management this past year, had not kept up. But the new management has really made some sound investments in the right places to make it a very compelling 4+ star option. I haven’t written a single “Best of the Maldives” piece about Makunudu to date, but I am coming away with lots of post material for the future (stay tuned).